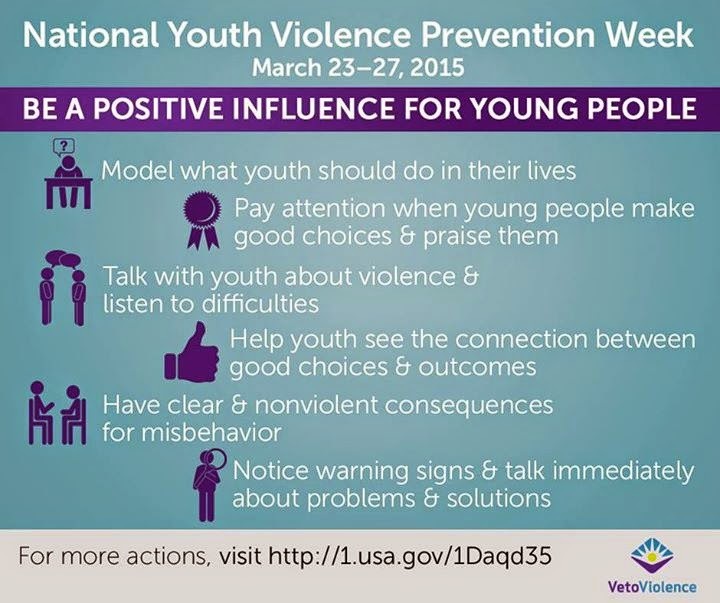 National Youth Violence Prevention Week (March 23-27, 2015) is a time to show youth, parents, educators, and community leaders that youth violence is not an inevitable part of growing up. Youth violence can be prevented. Help others be a positive influence on young people while stopping youth violence before it starts. More than 547,000 young people, ages 10 to 24, are treated in emergency departments each year for injuries from violence-related physical assaults. On average, 12 young people are victims of homicide each day in the United States. Prevention strategies that are proving effective include school programs designed to benefit all youth by changing how they think about violence and by building skills to resolve problems. Preventing Youth Violence: Opportunities for Action provides action steps for everyone to be part of the solution. This year we are excited to have a trio of internationally renowned speakers and researchers in Dr. Robert Anda, Co-Principal Investigator of the ACE Study, Dr. Desmond Runyan, Professor of Pediatrics at the University of Colorado and Mark Wynn, an expert in Domestic Violence. The conference is open to professionals and community members who work with children and families and have an interest in providing a safe and nurturing environment for our kids. This event is especially valuable for people involved in the following professions and activities: Case Workers, Child Advocates, Child Care, First Responders, Health Professionals, Home Visitation, Teachers, Law Enforcement, Legal & Judicial, Youth Programs, Social Workers, Therapists, Ministry and Coaches. Register: Visit our website to register or learn more! Join us for an informational webinar, hosted by the Kempe Center. Wednesday, April 15, 2015, 12 P.M. – 1 P.M.
SafeCare® Colorado is pleased to announce some upcoming dates and events for the start of Cohort 3 sites. Currently, SafeCare® is in 8 sites, covering 30 counties and the Southern Ute Tribe and Ute Mountain Ute Tribe. We welcome the opportunity to further expand this evidence based home visiting program which focuses on safety, health, and parenting. 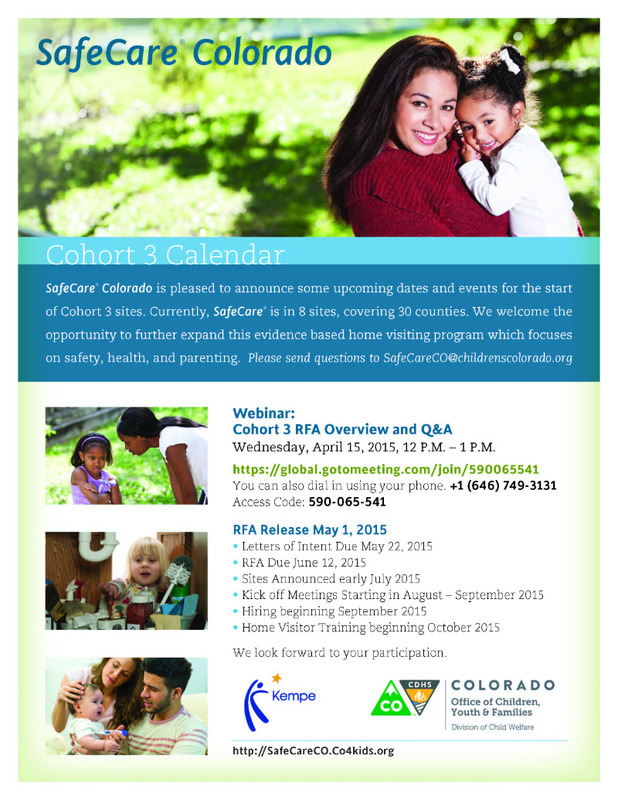 Click HERE to download and print the SafeCare® Colorado Cohort 3 Informational Flyer for the RFA timeline. Click HERE to download and print the SafeCare® Colorado Fact Sheet. a local SafeCare program today.